We spent much time in the past five years debating the differing understandings of what the Comprehensive Peace Accord (CPA) and the Agreement on Monitorign of Management of Arms and Armies (AMMAA) meant by 'integration and rehabilitation'. But all that was settled by the major political parties on 1 November with an agreement on numbers, amounts and modalities. We can, of course, always argue and speculate how the agreed package could have been better. But this is no time to be nit-picking and second guessing. The major challenge now lies with implementing the agreement. Many of the provisions in the 1 November agreement ��" such as return of seized property, ending the paramilitary structure of the YCL, and bringing the Maoist combatants fully under the command of the Special Committee��­-- are not really new. Even an agreement on the numbers of combatants and the financial package for rehabilitation was almost finalised at the Gokarna Resort summit a year ago, but was dropped because of internal disagreements within the Maoist party. Although there are still a few details to be worked out, the Special Committee has now prepared a very sensible plan for integration and rehabilitation. But, as they say, the devil is in the details which are ambiguous or remain unresolved. If the political leaders give clearer guidance, the committee can work out all technical and logistical details. The rehabilitation package is more complicated, as the Ministry of Peace and Reconstruction has not really done the required homework yet and it is questionable if it has the capacity to implement a sound vocational skill training, job creation and rehabilitation program. Complications that could crop up: Maoist combatants defying the agreement, haggling over their ranks in the army, uncertainty over the rehabilitation package, disagreement over how much combatants have to contribute to party coffers. If the combatants are given truly free choice, and the party does not try to manipulate or extort funds from the combatants, the regrouping exercise is likely to produce a generally honourable outcome for the combatants. But whether that will also be in the best interest of the nation is a different matter. We should have tried harder to maximize the 'peace dividend' from the expenditure. Now, there are two seemingly contradictory requirements: the need to reduce the size of the Nepal Army and the need to increase its size by integrating Maoist combatants. One way to tackle this would be to give priority to under-represented groups like women, Madhesis, Dalits, and some Janajati communities. Making the Nepal Army more inclusive and gender-balanced would eventually enable Nepal to respond to UN Security Council resolution 1325, under which the UN is encouraging member states to provide more women soldiers and officers in peace-keeping missions. The proposed voluntary retirement package offered is quite generous. But it would wise to pay the amount in several installments. Disbursement should also not be in cash but through banking channels, and preferably requiring the spouse's signature. One criticism of the 7-point agreement is that it does not say anything about 'democratisation and right-sizing' of the Nepal Army, which is also a key component of the peace process. � The CPA signed five years ago this week called for security sector reforms to ensure genuine civilian oversight over the national army and other security services. A detailed security sector reform (SSR) plan should be developed in due course keeping in mind Nepal's legitimate security interests, but avoiding unnecessary and unaffordable militarisation of Nepali society. Some Maoists have criticised the new directorate of the Nepal Army for disaster relief as a second-class, non-armed military unit. But such a directorate is appropriate because a peace-loving country like Nepal that has no intention of going to war against anybody needs to redefine the role of its military. Nepal's military should also strive to be the world's number one peacekeeper, not just quantitatively, but with enhanced quality and integrity. Here again, ex-Maoist combatants could eventually be trend-setters if a large number of combatants being integrated were women and from marginalised communities who can be groomed for future peace-keeping roles. I would therefore urge the Maoist leaders to be true to their proclamation of progressive pronouncements, not just in words but in deed, by encouraging a maximum number of women combatants to join the new Directorate. While it is urgent and important to conclude the integration and rehabilitation of ex-combatants, this is not enough for the real completion of the peace process in Nepal. In accordance with accepted international norms, there can be no room for violent politics in a functioning democracy. The Maoist party must thus abandon its militarist mindset. It must declare, in a manner that will be understood clearly by all its party members and the public at large that it has abandoned the politics of violence. Such a public commitment will help develop public confidence in peace-building and the new constitution. Some might say that the Maoists cannot do that because that would be contrary to their fundamental ideological belief, and that if they did so, they would be no different from the UML. Prime Minister Baburam Bhattarai, an ardent opponent of Indian foreign investment signed the BIPPA agreement with India, proving that the Maoists are capable of transforming themselves. For the sake of durable peace, prosperity and democracy in Nepal, let us hope that the Maoists will muster the courage and wisdom to further transform themselves, so they can help usher a truly progressive transformation of New Nepal. NT - Thank you for reproducing this analysis and advice by an expert Nepali. I agree about the transfer of fund via a bank requiring signatures from both spouses involved. It would be a real pity if the Maoist top brass and the Party took a cut from the combatants. Knowing the moral scale of BRB and PKD this could very easily happen and must be prevented. I have always said the Maoist are thugs. PKD bragged about turning to Nepal to Switzerland. ONLY PKD HAS BECOME RICH. 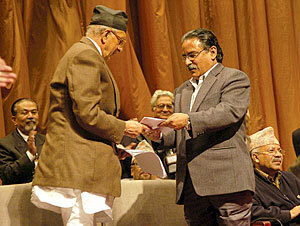 His party workers en masse and other Nepalis live in poverty. This is current state of Nepal, crooks and killers in charge. How can you move forward with that. At least the writer mentions democratization and right-sizing of the Nepal Army as part of Security Sector Reform. For the sake of durable peace, prosperity and democracy in Nepal, let us hope that people like this writer will muster the courage and wisdom to further transform themselves, so they can help usher a truly progressive transformation of New Nepal.